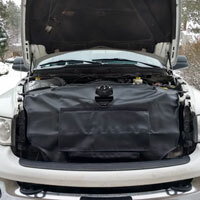 Improve engine warm-up time in cold weather with a Covercraft winter grille cover for your 2003-2009 Dodge Ram truck. In Summer the cover is rolled up and acts as a bug screen to help keep the radiator free-flowing for better cooling. 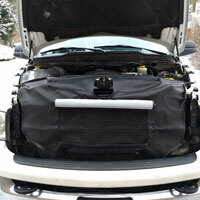 Cover fits well and took less than 5 minutes to install. Really like the adjustable panels that can be opened or closed depending on temperature. 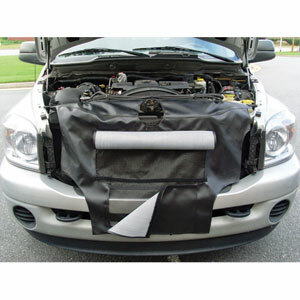 Material feels durable and the cover doesn't interfere with anything. Truck warms up quicker and holds at a perfect 190 degrees. Best part is I'm not freezing in the cab anymore! It works like it's intended to. Today was high of 0 degrees and the cover helped my cummins warm up faster. Super easy install. No instructions, though the cover literally drops right into place. I didn't see the elastic straps and books on the sides for about a week, but that's my fault. One thing I wish was different- the cover goes in front of the intercooler, blocking it along with the radiator. I'd like the cover behind the intercooler to keep it effective. That's my only reason for making it 4 instead of 5 stars. works great! cuts my warm up time in half! Easy to install. Fits directly over the radiator so it's hidden behind grille. The winter front fits perfect on my 2003 Cummins diesel! Simple to install and changes with variable temperatures. Will keep your Cummins sitting on 190. It hasn't been cold enough to use it yet, but, I have installed it and it fits great. I like that it has flaps that you can open if it's too warm, without having to remove the whole thing. I'm sure it will work great. fast service and shipping too!